Home » Uncategorized » Tim Cook’s “Vimy: the Battle and the Legend” wins the 2018 J.W. Dafoe Foundation’s Annual Book Prize! 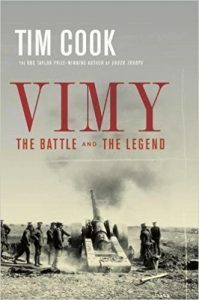 Congratulations to Dr. Tim Cook, whose book Vimy: The Battle and the Legend, has won the 2018 J.W. Dafoe Foundation’s Annual Book Prize! The prize memorializes John Wesley Dafoe, a significant Canadian author, journalist and editor, and is awarded annually to the best non-fiction work on Canadians, Canada, and Canada’s role in international affairs. Please join us in congratulating Dr. Cook on this well-deserved accolade! The Prize will be formally awarded at the J.W. Dafoe Foundation’s Book Prize Dinner on May 29 in Winnipeg accompanied by a presentation by the author at McNally Robinson Booksellers, 4000-1120 Grant Avenue in Winnipeg, on Wednesday, May 30th at 7:00pm. The talk is open to the public. Vimy: The Battle and the Legend examines the Canadian Corps’ capture of Vimy Ridge in April 1917 and the subsequent evolution of the battle’s meaning, documenting how and why this event has come to resonate with so many Canadians even 100 years later. Tim Cook is a historian at the Canadian War Museum, an Adjunct Research Professor at Carleton University, and a former director for Canada’s History Society. He was the curator for the First World War permanent gallery at the CWM, and has curated additional temporary, travelling, and digital exhibitions. In 2012, he was awarded the Queen’s Diamond Jubilee medal for his contributions to Canadian history and in 2013 he received the Governor General’s History Award for Popular Media: The Pierre Berton Award. He is a member of the Order of Canada and an associate with the LCMSDS.